Come and spend a week with like-minded souls, singing arrangements of pieces from the big shows, sacred music, world vocal and popular music. This course is designed for both beginners and more experienced choral singers. It will be an ideal introduction to choral singing through music you know and love. The course will end with a concert of some of the repertoire worked on over the week. Singing for Pleasure is an inclusive course for anyone who wants to sing, regardless of age or experience. Delving into choral repertoire from around the world, this course explores music that brings a smile to people's faces; both to the performer and listener alike. From singing sacred music, to musicals, world music, and popular song, this course seeks to demonstrate an insight to what it is to be a choral singer in various disciplines, and sing for pleasure. Adam was born in Bury St. Edmunds and graduated from the University of Leeds with an Honours Degree in Music. He specialised in Performance and Analysis, with a keen interest in early music and choral music. 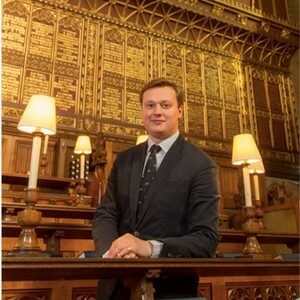 Prior to attending university, Adam was awarded a choral scholarship by St. Edmundsbury Cathedral as a bass, where he also began to learn the organ under the tuition of David Humphreys. At University, Adam held the positions of acting secretary and fundraising and sponsorship coordinator for the university's music society. In addition to this, he also conducted the university chamber orchestra and held a choral scholarship at Leeds Cathedral as a countertenor in his final year. At Leeds Cathedral, Adam was also invited to conduct the boys' choir on occasion for mass and vespers. He has sung on BBC Radio 3, BBC Radio 4, for HRH The Prince of Wales; and has also recorded a number of CDs. Whilst at university, Adam co-directed a small vocal ensemble specialising in early music to win the University of Leeds Chamber Music Competition in 2013. Adam was also timpanist for Leeds Baroque, session drummer for the artist Phoebe Katis, vocal soloist for the Headingley Academy of Operatic Research, he received freelance opportunities as a harpsichord player, and also composes (predominantly choral works).